SYNOPSIS: As a handyman at the hotel his father used to own, Skeeter Bronson (Adam Sandler) spends his days changing light bulbs and competing with the hotel’s smarmy manager (Guy Pearce) for the attention of the new owner’s beautiful, hard-partying daughter, Violet (Theresa Palmer). When his sister Wendy (Courteney Cox) asks Skeeter to babysit her kids for a week while she’s out of town, Skeeter entertains his niece and nephew with elaborate, original bedtime stories that transport them to exotic locales, including ancient Greece, the Wild West and outer space. When he tries to help his family by telling one outlandish tale after another, it’s the kids’ unexpected contributions that turn all of their lives upside down. Full of imaginative special effects and good-natured hilarity, Bedtime Stories is a winning combination of comedy and adventure. FILM REVIEW: The band Journey was really on to something with their hit song Don’t Stop Believing. If you want your dreams to come true, you’ve got to believe. This movie is an adventurous “journey” (yeah, I had to) for Skeeter Bronson (Adam Sandler) to learn exactly that, thanks mostly to his niece and nephew and their vivid imaginations. Gumballs, Ferraris, epic battles, and a kiss from a damsel in distress are all part of the fantasy that makes up this bedtime story. In this film there is a dashed line between fairy tale and reality and that is what makes it special. It has a touch of Disney magic and a touch of Adam Sandler comedy to make it fun for the whole family. Yes it is cliché and predictable, but it is funny, enjoyable, and very cute. That one word probably describes it best . . . cute. The story, the dialogue, the imagination, the niece and nephew played by Laura Ann Kesling and Jonathan Morgan Heit, and even their big-eyed pet Bugsy are all adorable. Oh yeah, so is Keri Russell in the role of Jill. Even with all the cuteness this movie has, it lacks a little in quality. There is a good amount of character presentation along with the foundation of the story during the opening of this movie and yet the viewer has a tough time identifying with any of the major characters. Adam Sandler’s forte is presenting approachable characters that people can relate to and connect with. It is a large part of his extraordinary success in films. I struggled to figure out Adam’s character in this movie. Is he a slacker, a genius, a lazy bum, a self-centered dreamer, a sleeping giant, or just simply a talented guy who patiently waits for his big break? I couldn’t put my finger on it and thus I didn’t know where he was coming from during the movie. Same goes for his sister Wendy played by Courteney Cox as well as Jill (Keri Russell). These are most of the major characters and you can understand what is going on between them but their development is too shallow and their motivation is unclear. Some of the supporting roles were too obvious to mistake, though. Such as Violet Nottingham played by Teresa Palmer. She is the spoiled, self-proclaimed celebrity daughter of the rich hotel owner Barry Nottingham (Richard Griffiths). Hmmm, sounds familiar doesn’t it? Guy Pearce plays Kendall, the selfish hotel executive with a hidden agenda that benefits only himself. Can I tell you that I didn’t even recognize Lucy Lawless as Aspen who works at the front desk of the hotel and is Kendall’s accomplice. Russell Brand delivers another goofy, light-hearted role as Mickey, hotel employee and friend to Skeeter. All in all, everybody gave a decent performance but those main characters where hard to connect with. Luckily, the story wasn’t. Given the nature of the story, you would have to expect the visual effects to keep up and they did. Not the best stuff ever but good enough for this production. You are taken to the Wild West with cowboys, Indians, and fast horses, a Roman coliseum for some chariot tricks, medieval times with knights in shining armor, and to the future on board a space station. The sky is not the limit when it comes to the imagination used in this picture. Even when it comes back to reality in the end, the climax of the film is really quite exciting and brings the whole thing together in Disney style. Director Adam Shankman has directed some good projects this decade; Wedding Planner, A Walk to Remember, Bringing Down the House, The Pacifier, and Hairspray to name a few. This is not his best work but it can definitely be included in this list. BLU-RAY: The film is presented in 1080P widescreen in a 2.35:1 aspect ration preserving its theatrical format. The picture is just flawless, giving the film and special effects clarity that only high definition can provide. Not only the picture looks excellent in this release, also the sound it is good, a 5.1 DTS-HD Master Audio (48kHz/24bit) that provides a good complement to the picture , however I was very surprised to find that the sound was not 7.1 DTS-HD. Not sure why Disney Home Entertainment decide to go with a 5.1 audio, instead of the 7.1. The 3-disc Blu-ray is a limited time Special Offer Combo Pack that also includes a DVD copy of the of the film, allowing fans to own this classic story on standard def DVD while they are preparing to upgrade to 1080p Hi-def Blu-ray, so consumers can “future-proof” their collection. 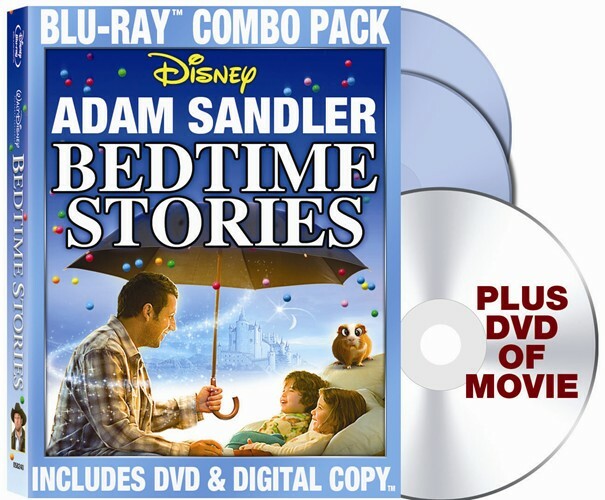 In terms of Special Features, the Bedtime Stories's three disc blu-ray falls a little bit short. Even though it includes a DVD copy of the film and a Digital copy, I was expecting more. It includes three short featurettes about the production. The first one is "Until Gravity Do Us Part" which talks about the gravity fighting scene between Adam Sandler and Guy Pearce. The Second one is "It’s Bugsy", another short featurette about Bugsy the big-eyed guinea pig. And finally "To All The Little People", in which the big Hollywwod stars talk about their experience working with the talented kids of the film. If you enjoyed the film the Blu-ray also includes about twelve deleted scenes that you may want to ckeck out. It also includes about seven minutes of outtakes, which are without a doubt the best featurette of the Blu-ray, really funny. Like previous release the blu-ray comes with DB-Live, which allow users to get exclusive online content, users get opportunity to chat, participate in movie challenges and access movie mail. Your blu-ray player will need to be connected to the internet, in order to access this features. Overall this release will be a good addition to your Disney collection. Cutting Room Floor: Deleted Scenes A total of twelve deleted scenes, wroth watching if you enjoyed the film. (10:20 ). DisneyFile Digital Copy that enables viewers to enjoy the film on an array of mobile devices in their choice of iTunes or Windows Media formats.